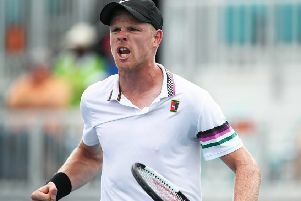 British No 1 Kyle Edmund lost his cool in the Florida sun as he was beaten in straight sets by John Isner in their fourth-round match at the Miami Open. After Isner claimed the opening set on a tie-break, Edmund had recovered to force another in the second. However, when serving at 3-5 down, there was a shout of “out” from the crowd following a return from the American down the baseline. Edmund was ruled to have lost the point, which left world No 9 Isner 6-3 ahead and serving for the match. After another heated exchange with the chair from the Briton before play eventually resumed, Isner produced his 17th ace to seal his place in the quarter-finals with a 7-6 (5), 7-6 (3) win in one hour and 43 minutes which keeps him on course for a successful title defence. There was little sign of the drama to follow as Isner had earlier looked to have taken control of the opening set when a break and then a hold saw him move 5-2 ahead. However, as the sun on the Stadium Court continued to impact on serving, Edmund – who beat Milos Raonic in round three – recovered to break back and level at 5-5 before forcing the tie-break. 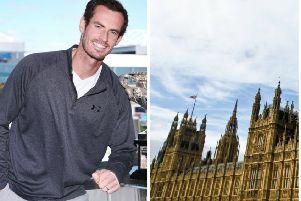 The Briton, No 22 in the world, then produced an early mini-break on Isner’s serve to move 3-0 and then 4-1 ahead. Isner, though, responded to level at 5-5 after two mini-breaks with another handing him a set point which the American confidently dispatched on serve. Three-time Miami Open winner Roger Federer is through to the fourth round after beating Filip Krajinovic 7-5, 6-3. The Swiss world No 5, who is the fourth seed in Florida, served up 14 aces to set up a meeting with Daniil Medvedev. Federer and his Serbian opponent exchanged breaks of serve early in the first set, with the 20-time grand slam winner taking a set-clinching break at 6-5. He took an early break in the second set, for 2-0, before going on to serve out the match after just over 90 minutes on court. Medvedev was made to work for his win, spending nearly two-and-a-half hours on court with Reilly Opelka and prevailing 7-6 (5), 6-7 (5), 7-6 (0). Australian Jordan Thompson, world No 77, knocked out 24th seed Grigor Dimitrov 7-5, 7-5 and goes on to face Kevin Anderson, who saw off Joao Sousa 6-4, 7-6 (6). Denis Shapovalov took less than 30 minutes to go a set up, but needed a further hour to finish off Andrey Rublev 6-3, 7-6 (5), while David Goffin beat 14th seed Marco Cecchinato 6-4, 6-4 and Frances Tiafoe got the better of David Ferrer 5-7, 6-3, 6-3. Australian Open semi-finalist Stefanos Tsitsipas also progressed, beating Leonardo Mayer 6-4, 6-4. In the women’s draw, Simona Halep prevailed in the battle of the former world No 1s when she saw off Venus Williams 6-3, 6-3. Halep, now the world No 3, broke Williams’ first two service games and pushed home her advantage, taking the first set inside 33 minutes. The second was a tighter affair, a solitary break for the Romanian for 3-1 being the difference. Halep will now face Qiang Wang who defeated compatriot Yafan Wang 7-5, 6-4. Qiang, the 18th seed, booked her first quarter-final appearance in Florida having secured a walkover in the previous round against Serena Williams. Also through are Karolina Pliskova, who toiled to a 2-6, 6-3, 7-5 win over Yulia Putintseva, Marketa Vondrousova, who beat Tatjana Maria 6-4, 6-3, and Petra Kvitova, who outlasted Caroline Garcia 6-3 6-3. Caroline Wozniacki went out to 27th seed Su-Wei Hsieh 6-3, 6-7 (0), 6-2, Ashleigh Barty beat Kiki ertens 4-6, 6-3, 6-2 and Bianca Andreescu retired against Anett Kontaveit.